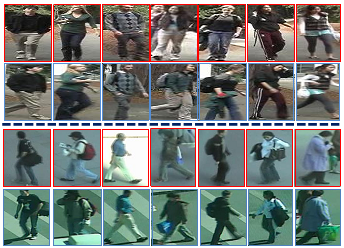 Person re-identification deals with automatically tracking individuals across cameras without overlapping field of view. It is an important task to assist security personnel to monitor pedestrian behavior at wider areas with reduced costs. In person re-identification, we have a gallery set and the objective is to match a probe image with one of these individuals. Using image pairs, present in the training set, we can learn similarity models. One the main challenge in person re-identification is the higher inter-class similarities than intra-class similarities caused by similar dressing patterns and acquisition conditions (illumination, viewpoint, etc.). We have published works based on the combination of different color descriptors through a ranking aggregation strategy (CBRA) and using prototypes to indirectly handle with the camera transition problem (ICB 2015). Click here for a comprehensive list with results for several person re-identification datasets. HPCA reaches a better combination of subspace learning and dimensionality requiring significantly lower subspace dimensions. The automation of surveillance systems is important to allow real-time analysis of critical events, crime investigation and prevention. A crucial step in the surveillance systems is the person re-identification (Re-ID) which aims at maintaining the identity of agents in non-overlapping camera networks. Most of the works in literature compare a test sample against the entire gallery, restricting the scalability. We address this problem employing multiple indexing lists obtained by color name descriptors extracted from partbased models using our proposed Predominant Color Name (PCN) indexing structure. PCN is a flexible indexing structure that relates features to gallery images without the need of labelled training images and can be integrated with existing supervised and unsupervised person Re-ID frameworks. Experimental results demonstrate that the proposed approach outperforms indexation based on unsupervised clustering methods such as k-means and c-means. Furthermore, PCN reduces the computational efforts with a minimum performance degradation. For instance, when indexing 50% and 75% of the gallery images, we observed a reduction in AUC curve of 0.01 and 0.08, respectively, when compared to indexing the entire gallery. Person re-identification (Re-ID) keeps the same identity for a person as he moves along an area with nonoverlapping surveillance cameras. Re-ID is a challenging task due to appearance changes caused by different camera viewpoints, occlusion and illumination conditions. While robust and discriminative descriptors are obtained combining texture, shape and color features in a high-dimensional representation, the achievement of accuracy and efficiency demands dimensionality reduction methods. At this paper, we propose variations of Kernel Partial Least Squares (KPLS) that simultaneously reduce the dimensionality and increase the discriminative power. The Cross-View KPLS (X-KPLS) and KPLS Mode A capture cross-view discriminative information and are successful for unsupervised and supervised Re-ID. Experimental results demonstrate that XKPLS presents equal or higher matching results when compared to other methods in literature at PRID450S.